Cook quinoa according to the directions on the bag. Let cool until cool enough for you to touch/handle. Place wax paper on a large baking sheet and set aside. Add the cooked quinoa to a large bowl. Add in the cheese, egg, pumpkin puree, breadcrumbs, salt and pepper. Stir to incorporate. Using a large cookie scoop or ice cream scoop, scoop quinoa mixture into balls then gently form them into 1/4-inch thick patties. 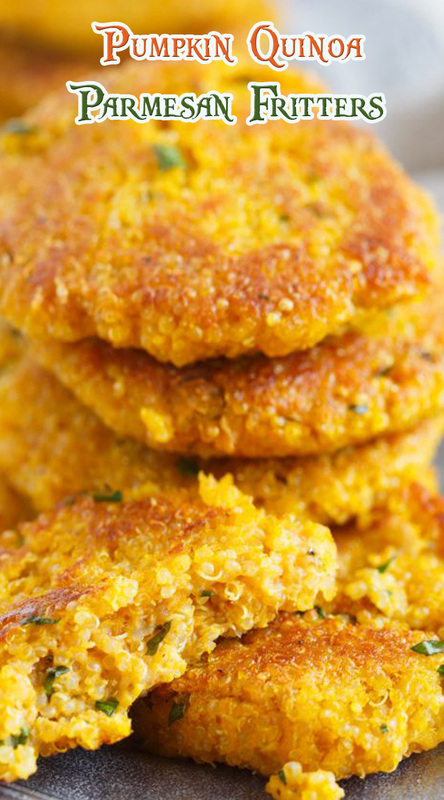 Place on wax paper and continue to form patties until all quinoa has been used up. In a large skillet, add 1 tablespoon of vegetable oil into the skillet over medium-high heat. Add two fritters into the skillet and cook until browned on one side. Using a large spatula, flip fritters and continue to cook until fritter is browned and warmed through. The fritter is slightly softer than most fritters - it shouldn't fall apart on you if you are gently enough with it. Continue cooking until all fritters have been cooked.